The thyroid glands are enclosed by a thin capsule of connective tissue and composed of numerous colloid-filled follicles with little interstitial tissue in between. Size and shape of the follicles depend on their activity. Small and spherical follicles are present in very active thyroid glands. Less active glands have large follicles filled with a considerable amount of colloid. 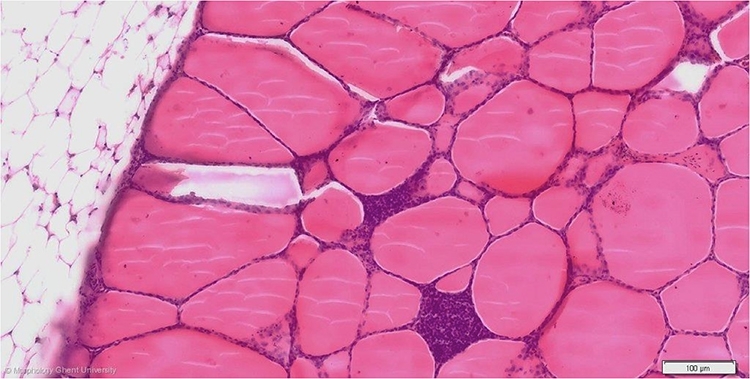 In older, laying hens, the thyroid glands are surrounded by a considerable amount of adipose tissue, as is shown on the micrograph above.